Click here to access the current edition of our newsletter. Despite using “state-of-the-art technology,” the environment-friendly Smith Ranch received 42 license violations involving surface spills and leaks from December 31, 1999 through May 21, 2007 (WISE - World Information Service on Energy - Uranium Project). 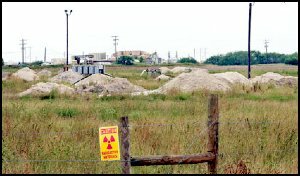 On March 10, 2008 Wyoming’s Department of Environmental Quality/Land Quality Division (LQD) issued a Notice of Violation to Power Resources, Inc. (PRI) a wholly owned subsidiary of Cameco Corp for numerous deficiencies at their Smith Ranch-Highland Uranium Project. The seriousness of these deficiencies is apparent by LQD’s section on Reclamation Cost/Bonding: “Considering that reclamation will take several times longer, require at least twice the staff with higher wages and require much greater investments in infrastructure than PRI has estimated, a realistic reclamation cost estimate for this site would likely be on the order of $150 million, as compared to PRI's current calculation of $38,772,800. PRI is presently bonded for a total of only $38,416,500. No bond adjustments have been made since 2002. Clearly the public is not protected.” (For more information, see Wyoming In Situ Leach Uranium Mines Violated State Law). Selenium (Se) is a naturally occurring element that is found in shales underlying the central and western USA, as well as other areas throughout the world. It is found in the environment where there are outcrops of this shale, or where the Se containing sediments are disturbed. The Se present in the shale can be moved by plants, by leaching in agricultural runoff, by mining certain materials such as uranium and from other natural and industrial sources (Hossner et al. 1992, Lemly 1999, Sors et al. 2005a, b). Scientist Dr. Gordon Edwards recently wrote, “Uranium ore bodies are among the deadliest mineral deposits on earth. They harbor large quantities of dangerous radioactive materials” (pacificfreepress.com). Radium, a decay product of uranium commonly found in uranium mine tailings piles, has been labeled by the British Columbia Medical Association as a superb carcinogen because microscopic quantities can cause bone and head cancers, anemia, and leukemia. Polonium-210, which is as radioactive as uranium and a billion times more toxic than cyanide, is a by-product of uranium mining and found in mine tailings. A uranium mine releases radon, which blankets the ground hundreds of miles downwind from a uranium mine as solid radioactive fallout. The following article was originally published in the Corpus-Christi Caller-Times on November 5, 2006 and is reprinted here by permission from the author Dan Kelley. As uranium mines in Texas closed one-by-one during the past two decades, the mining companies had one thing in common: They asked the state to relax he groundwater restoration standard listed in their mining permits. State regulators had one response: "OK."